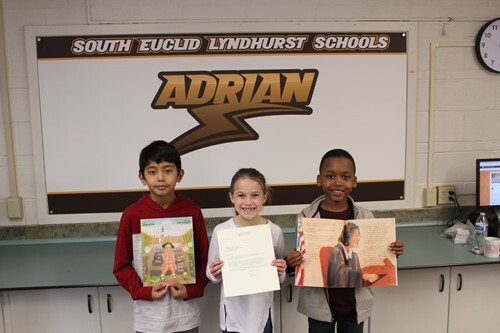 3rd graders in the gifted ALPHA Reading program at Adrian, Rowland and Sunview Elementary Schools recently completed a learning activity that involved corresponding with Associate Justice of the Supreme Court of the United States Sonia Sotomayor! Under the guidance of Gifted Intervention Specialist Mrs. Marcia Armbruster, students read a book in ALPHA Reading class about Supreme Court Justice Sotomayor, titled Sonia Sotomayor: A Judge Grows in the Bronx. The students then wrote blog posts providing their reaction to the biographical book, specifically sharing what they would do to make a world a better place if they served as a U.S. Supreme Court justice, as well as how they would emulate Justice Sotomayor by being “unstoppable” in pursuing their future goals. Shortly after the start of the New Year, Mrs. Armbruster printed and mailed the students’ blog posts along with a letter explaining the project to Justice Sotomayor’s office. To the surprise of everyone, Justice Sotomayor quickly responded with a lovely letter of gratitude and encouragement to the students. In addition, each student received a personalized picture signed by Justice Sotomayor! The ALPHA Reading students are extremely proud to have participated in such an unforgettable learning experience.